In the pantheon of great individual sports achievements, some names and numbers practically define the pinnacle of the sport; for example Jack Nicklaus’ 18 golf Majors and Roger Federer’s 16 tennis Grand Slams. 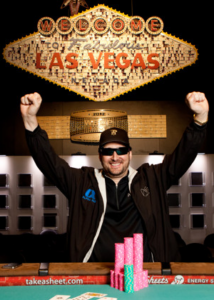 Phil Hellmuth can now undisputedly be added to that list of all-time great sports champions, as he recorded his 12th bracelet win at the World Series of Poker. 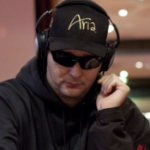 Hellmuth has become known for many things over the years, including his “poker brat” personality and outburst. His achievements at the tournament felt, particularly at the World Series of Poker, were already second to none, as Hellmuth already held the most bracelets of any player and had cashed the most times in WSOP events (almost 90!). 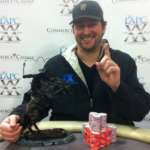 But there was always one little asterisk: all of Hellmuth’s wins only came in Texas Hold’em events. Three second place finishes in last year’s WSOP in non-Hold’em events (one of which was the $50,000 Player’s Championship) as well as almost winning 2011 WSOP Player of the Year honors did much to put that disclaimer to rest, but only now is the monkey truly off Hellmuth’s back, with a win in Razz (check out our razz poker page for more information). It had been 5 “long” years since Hellmuth won his 11th career bracelet, to take sole possession of first place on the all-time list, ahead of Doyle Brunson and Johnny Chan who each had 10. Many believe that Brunson and Chan are past their primes and will no longer contend for bracelets. 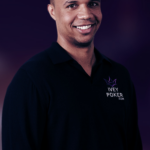 Hellmuth’s main “competition”, then, comes from Erik Seidel and Phil Ivey, each of whom have 8 bracelets, and undoubtedly still have the poker skills, motivation, and intestinal fortitude to keep winning more. 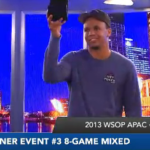 Ivey, who didn’t play in last year’s World Series of Poker, is chomping at the bit, with seventh- and second-place finishes in this year’s slew of events already. Unlike golf and tennis, poker is a game that can be played at elite levels well into advanced age. 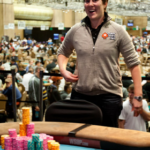 With Hellmuth in his early 40s and Ivey and Seidel relative spring chickens, chances are we’ll continue to witness their bracelet totals rise in accordance with their greatness at the felt for many years to come. If you’re itching to see the victory, PokerNews captured Hellmuth’s special moment in this video (start at the 3:00 mark). WSOPE Event #1: Phil Hellmuth AGAIN in Contention for Bracelet #12!